Chemical leak at a chemical plant in the Pudong New Area cause an explosion Sunday morning. The explosion occurred Sunday morning at Shanghai Huayi Acrylic Acid Company in the town of Gaoqiao – officials communicated that no one was hurt. According to a witness, who lives approximately 100 meters away from the plant said, “I saw big explosions and thick yellow smoke that had an acrid smell”. Investigators are still determining if the smoke appeared following the explosion was from burning Acrylic Acid or another substance. Acrylic Acid is a clear and colorless organic compound mainly used to manufacture plastics and other products. The chemical has an acrid odor to it and is very irritating and corrosive to the skin. Exposure to Acrylic Acid is usually found in the workplace and high exposure to the chemical can have serious effects to the body. Exposure to the eye can result in severe injury. It is critical that storage of Acrylic Acid is maintained and is monitored closely. Since Acrylic Acid can be ingested, absorbed through the skin and inhaled it is important that each of these exposure routes must be managed properly. Personal protective equipment is important when handling Acrylic Acid. According to the EPA, Acrylic Acid is “mainly used in the manufacturing of plastics, paint formulations, and other products. “ Also widely used in “latex applications, floor cleaners/polish, coating applications, paint formulations, leather finishing and paper coatings”. 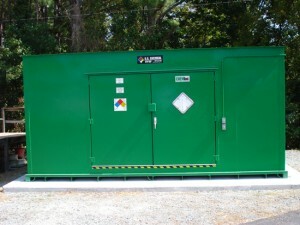 Our Caustic chemical storage buildings are perfect for storing corrosive chemical inventory. We offer 100% compliance meeting all EPA and OSHA regulations with all of our buildings. 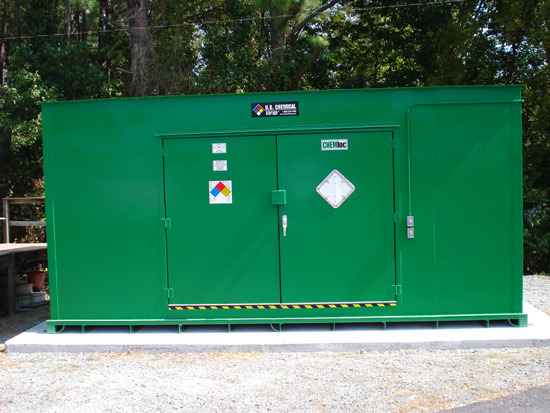 Caustic storage buildings protect chemical inventory from temperature extremes and can be customized to maintain the air quality so chemical inventory will not react with heat or warm air. Recommended Acrylic Acid bulk storage temperature range is 15 to 25 ̊C (59 to 77 ̊F). Freezing of Acrylic Acid should be avoided because of the dangers of thawing it; (freezing point is 13 ̊C [55 ̊F). Eye Wash Station and Shower Stall: Customize your Acrylic Acid chemical storage building for maximum personnel protection. Our free standing shower and eye wash station allows your personnel to remain protected in case of an accident. In remote areas the wash stations can be very critical for individual’s health care.